Using a discovery platform whose components range from yeast cells to human stem cells, Whitehead Institute scientists have identified a novel Parkinson’s disease drug target and a compound capable of repairing neurons derived from Parkinson’s patients. The platform—whose effectiveness is described in dual papers published online this week in the journal Science—could accelerate the discovery of drug candidates that address the underlying pathology of Parkinson’s and other neurodegenerative diseases. Today, no such drugs exist. Parkinson’s disease (PD) and such neurodegenerative diseases as Huntington’s and Alzheimer’s are characterized by protein misfolding, resulting in toxic accumulations of proteins in the cells of the central nervous system. Cellular buildup of the protein alpha-synuclein, for example, has long been associated with PD, making this protein a seemingly appropriate target for therapeutic intervention. In the search for compounds that might alter a protein’s behavior or function—such as that of alpha-synuclein—drug companies often rely on so-called target-based screens that test the effect large numbers of compounds have on the protein in question in rapid, automated fashion. Though efficient, such an approach is limited by the fact that it essentially occurs in a test tube. Seemingly promising compounds emerging from a target-based screen may act quite differently when they’re moved from the in vitro environment into a living setting. To overcome this limitation, the lab of Whitehead Member Susan Lindquist has turned to phenotypic screens in which candidate compounds are studied within a living system. In Lindquist’s lab, yeast cells—which share the core cell biology of human cells —serve as living test tubes in which to study the problem of protein misfolding and to identify possible solutions. Yeast cells genetically modified to overproduce alpha-synuclein serve as robust models for the toxicity of this protein that underlies PD. "Phenotypic screens are probably underutilized for identifying drug targets and potential compounds.Here, we let the yeast tell us what is a good target. 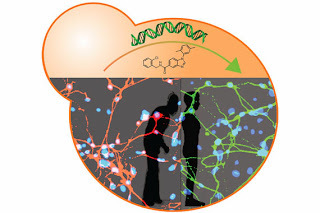 We let a living cell tell us what’s critical for reversing alpha-synuclein toxicity." said Daniel Tardiff, a scientist in the Lindquist lab and lead author of one of theScience papers. In a screen of nearly 200,000 compounds, Tardiff and collaborators identified one chemical entity that not only reversed alpha-synuclein toxicity in yeast cells, but also partially rescued neurons in the model nematode C. elegans and in rat neurons. Significantly, cellular pathologies including impaired cellular trafficking and an increase in oxidative stress, were reduced by treatment with the identified compound. Enabled by the chemistry provided by Nate Jui in the Buchwald lab at MIT, Tardiff found that the compound was working by restoring functions mediated by a cellular protein critical for trafficking that was previously thought to be "undruggable." But would these findings apply in human cells? To answer that question, husband-and-wife team Chee-Yeun Chung and Vikram Khurana led the second study published in Science to examine neurons derived from induced pluripotent stem (iPS) cells generated from Parkinson’s patients. The cells and differentiated neurons (of a type damaged by the disease) were derived from patients that carried alpha-synuclein mutations and develop aggressive forms of the disease. To ensure that any pathology developed in the cultured neurons could be attributed solely to the genetic defect, the researchers also derived control neurons from iPS cells in which the mutation had been corrected. Chung and Khurana used the wealth of data from the yeast alpha-synuclein toxicity model to clue them in on key cellular processes that became perturbed as patient neurons aged in the dish. Strikingly, exposure to the compound identified via yeast screens in Tardiff’s study reversed the damage in these neurons. "It was remarkable that the compound rescued yeast cells and patient neurons in similar ways and through the same target—a target we would not have identified without yeast genetics to guide us," saids Khurana, a postdoctoral scientist in the Lindquist lab and a neurologist at Massachusetts General Hospital who recruited patients for participation in this research. Khurana believes that the abnormalities discovered occur in the early stages of disease. If so, successful manipulation of the targets identified here might help slow or even prevent disease progression. For the researchers involved, these findings are a bit of surprise. Because neurodegenerative disorders like PD are largely diseases of aging, modeling them in a culture dish using neurons grown from iPS cells has been thought to be exceedingly difficult, if not impossible. "Many, ourselves included, were skeptical that we could find any important pathologies for a neurodegenerative disorder by reprogramming patient cells,Critically, we also validated these pathologies in post-mortem brains, so we’re quite confident these are relevant for the disease." said Chung, a Senior Research Scientist in the Lindquist lab. Next steps for these scientists include chemically optimizing the compound identified and testing it in animal models. Moreover, they are convinced that this yeast-human stem cell discovery platform could be applied to other neurodegenerative diseases for which yeast models have been developed. "Using yeast genetics to identify a compound and its mechanism of action against the fundamental pathology of a disease illustrates the power of the system we’ve built. It’s critical that we continue to leverage this power because as we reduce the rate at which people are dying from cancer and heart disease, the burden of these dreaded neurodegenerative diseases is going to rise. It’s inevitable." says Lindquist, who is also professor of biology at MIT and a Howard Hughes Medical Institute investigator.